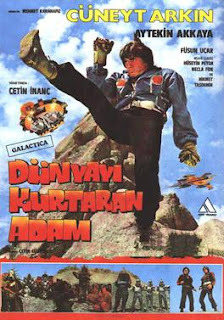 After two years of restoration of the last known reel of the movie in existence and digital conversion, the atrociously campy cult film that’s better known by the moniker “Turkish Star Wars,” the 1982 Dünyayı Kurtaran Adam (previously) or The Man Who Saved the World will be enjoying a limited theatre run in London and Glasgow later this summer (May the Fourth be with you). The movie—hitherto only watchable on bootlegged video cassette copies—gained notoriety for its unauthorised use of footage from the actual Star Wars, with other science fiction films and space programme scenes spliced in, has quite an incoherent plot and was roundly panned by critics at the time. Despite its poor reception, a sequel was produced in 2006, Dünyayı Kurtaran Adam'ın Oğlu (The Son of the Man who Saved the World—otherwise “Turks in Space”) but audiences (never easily satisfied) were also critical of the second movie for having professional actors and special effects and was no longer true to the original. Visit the link above to see a video of a few scenes. I think it’s fun that there’s a revival of such an unambiguously bad movie, but I also hope that the attention it garners directs more people to the finer side of Turkish cinema and film-making, as well.